Every surgical operation has a tendency to complications, and only the surgeon who does not operate has no complications. A knowledge of relevant complications and sequelae is essential to enlighten the patient so that an informed decision can be made, for reducing the incidence of such complications, for minimizing the gravity of an impending complication, and for treating a complication once it has occurred. Some complications of rhinoplasty relate to anesthesia and do not fall within the bounds of this discussion. Anaphylactic reactions to general and local anesthetics may well tax the knowledge and skill of the anesthesiologist, surgeon, and attending staff. An image depicting a rhinoplasty complication be seen below. Failure to appreciate the role of the lower lateral cartilages in tip and alar support may cause problems. Transection of these cartilages near the domes and excessive excision may cause collapse of the alae and a pinched tip. In this case, the cartilaginous dorsum is also overexcised. Along with a pinched tip and saddling, alar collapse leading to nasal airway embarrassment was noted. The physical reality of an individual's appearance: How do others see the patient? Society has agreed on certain definitions of beauty and unattractiveness, thereby imposing standards and feelings on the vulnerable individual. The individual's perception of that appearance: How does the patient see himself or herself? Is this perception congruent with reality as perceived by others? The degree of importance the individual attaches to appearance: Some individuals may attach little importance to their appearance, while some cosmetic surgery patients may derive a great deal of self-esteem from their appearance. The degree of dissatisfaction the individual has with his or her appearance: Displeasure with appearance ranges from minor dissatisfaction, causing mild concern, to body dysmorphic disorder, causing obsessive preoccupation to the point of interfering with normal function. Approximately 2% of cosmetic surgery patients have body dysmorphic disorder and may need psychiatric appraisal. Aesthetic sense is difficult to define, and it is much harder to agree on results. Aesthetics depend on variables, including the current fashion taste, the media, the public relations industry, and cultural and ethnic differences. A practical approach to aesthetics in the nose begins with an accurate assessment. Frontal views define x-axis (width) and y-axis (height) deformities, lateral views define z-axis (depth/projection) and y-axis deformities, and basal views define x-axis and z-axis deformities. Based on these views, a 3-dimensional concept of the nose is made available for manipulation. The goal of rhinoplasty is to improve the existing harmony without causing functional impairment. According to the literature, the complication rate for nasal surgery varies from 4-18.8%. In individual hands, this rate generally falls as surgical experience accumulates. Skin and associated soft tissue complications occur in up to 10% of cases. According to estimates, severe systemic or life-threatening complications occur in 1.7-5% of rhinoplasty cases. Intracranial complications are rare. This may relate to a genetic or acquired coagulopathy. The former should be investigated before surgery. If it has not been investigated, urgent consultation with a hematologist at the time of surgery is advised. Acquired coagulopathy is usually drug induced, and aspirin is usually a culprit. This drug should be stopped at least 2 weeks before surgery. Primary fibrinolysis causing excessive bleeding during rhinoplasty has been reported. This disorder is due to an abnormal activation of the fibrinolytic system leading to rapid clot dissolution. Blood tests for fibrinogen, fibrinogen degradation products, and euglobulin lysis time aid in making the diagnosis. In one particular case, it was treated with aminocaproic acid to good response. Consultation with a hematologist is advised when excessive bleeding occurs. Management may involve use of blood products, epsilon aminocaproic acid, and tranexamic acid. These agents may also cause problems such as deep vein thrombosis and pulmonary embolism. Inadequate local hemostasis may cause excessive intraoperative bleeding, contributing to operative difficulty and increased operating time. Excessive intraoperative hemorrhage reportedly occurs in 0.3-1% of cases. A patient and meticulous technique usually prevents this complication, but it is difficult to avoid in noses that have been traumatized or that have had previous operations. Unilateral tears usually heal without incident, but bilateral aligned tears of the septal mucous membrane may result in a septal perforation and accompanying symptoms. Suturing these bilateral tears at the time of surgery with an intervening cartilage graft is best. Opposing tears of the septum and lateral wall may lead to synechiae formation and nasal obstruction. Symptomatic synechiae may need subsequent release. Buttonholing of skin: This complication can occur during undermining of skin, particularly over the dome region; it is best avoided by careful attention to technique. Buttonholing may lead to scarring. If buttonholing occurs, attempt accurate nontension suturing to minimize scarring. Further treatment may be necessary if a scar results. Cautery burns: Complications of this nature may be related to mechanical failure or to surgical error. Exercise appropriate caution when using cautery. Depending on the situation, relevant measures must be instituted if a burn occurs. Skin necrosis may result in a scar. Collapse of the bony pyramid may occur during removal of a bony hump with an osteotome, particularly when the patient has had previous nasal trauma or if the vomer or ethmoid have been weakened as a result of previous surgery. Rasping may be advisable in these circumstances. Rectification requires careful approximation of the segments and provision of adequate internal and external splint support during healing. Disarticulation of upper lateral cartilage: This complication may occur during rasping. Bilateral disarticulation produces an inverted-V deformity, and unilateral disarticulation produces asymmetry in the middle third of the nose. Spreader grafts may improve airway symptoms and aesthetics. "Rocker" deformity: This deformity results when the medial osteotomy creates a cephalic fracture higher in the thicker part of the frontonasal junction. Attempted narrowing after the osteotomies results in lateralization of the superior segment of the fractured bones, based on a fulcrum at or about the radix. Repositioning the cephalic fracture lower on the nasal bone rectifies this deformity. See the image below. Diagrammatic representation of the "rocker" deformity. The deformity on the left side may be corrected by lower recreation of the transverse cephalic fracture, as on the right side. 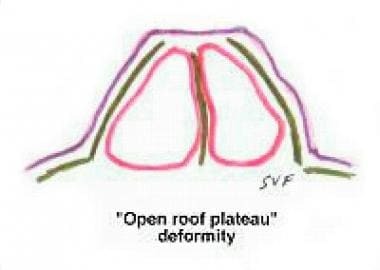 Diagrammatic representation of the "open roof" deformity. "Step" deformity: This deformity may result if a single lateral osteotomy is performed too far medial to the nasofacial groove, with a visible ridge on the side of the nose. Correction involves repeating the osteotomy at the correct level. See the image below. 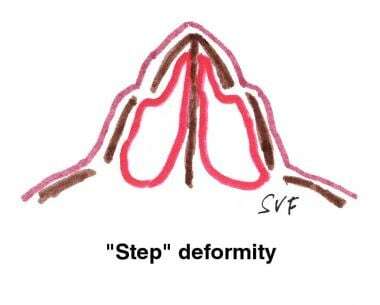 Diagrammatic representation of the "step" deformity. Perinasal trauma: During osteotomy, particularly in noses that have previously been traumatized, there is a tendency to recreate preexisting fractures. The proximity of the orbit and cranium renders these structures most susceptible to such occurrences. Malfunction can result directly or can manifest subsequent to infection. Orbital hemorrhage and orbital cellulitis threatening vision need immediate attention in consultation with an ophthalmologist. Nasolacrimal apparatus injuries also may occur, and persistent symptoms may require fistulization of the sac into the nasal cavity. Infraorbital nerve injury has been reported. Cranial complications are discussed below. Airway obstruction: Postextubation aspiration of blood may cause laryngospasm. This may require treatment with a muscle relaxant and reintubation or positive pressure ventilation. Nasal packing or intranasal splint aspiration also may cause airway obstruction. When these are in place, they must be adequately secured. Visual impairment: Transient and permanent deterioration of vision has been described subsequent to local anesthetic and vasoconstrictor injection. This may relate to vasospasm or thromboembolism causing ophthalmic ischemia. If symptoms persist, relevant consultation is advised. Hemorrhage: Reported prevalence of hemorrhage varies from 2-4%. Attempt to localize the source of bleeding after appropriate vasoconstrictor application. Endoscopic cauterization of the offending vessel may be possible. The nose may require packing and antibiotic cover. Major artery ligation for persistent bleeding has been reported. Septal hematoma: This may need daily aspiration until the return is free of blood. Some authors advocate a larger incision to aid drainage and subsequent packing for 48 hours. Antibiotic coverage is indicated to guard against formation of a septal abscess. Septicemia: Awareness of the possibility of this complication is essential. The pyrexia of infection may lead to hypothermia of acute circulatory failure and multiple organ dysfunctions. Relevant consultation concerning antibiotic medication, steroids, management of circulatory failure, and disseminated intravascular coagulation may be necessary. Toxic shock syndrome:  Postoperative fever, vomiting, diarrhea, hypotension without obvious blood loss, and an erythematous sunburnlike rash characterize this syndrome. In severe cases, shock may manifest. A few days later, desquamation of the skin of the palms and soles may occur. The supertoxin, toxic shock syndrome toxin-1 (TSST-1), produced by the organism Staphylococcus aureus, causes this syndrome. The incidence of such nasal carriers is between 18-50% in the healthy population. Treatment involves (1) removal of nasal packing and acquisition of nasal cultures, (2) immediate administration of appropriate beta-lactamase–resistant antistaphylococcal antibiotics, (3) initiation of multisystem investigations and life support, and (4) pursuance of aggressive hemodynamic resuscitation. Toxic shock syndrome follows nasal surgery in 0.016% of cases, and the mortality rate is about 11%. Subacute bacterial endocarditis: Every patient with a cardiac murmur is at risk. Ensuring good dental health and antibiotic prophylaxis is essential. Blood cultures and relevant consultation are indicated if this complication ensues. Intracranial infections: Proximity of the cranium and provision of a traumatic pathway during an operation influences the likelihood of meningitis, subdural empyema, cerebral abscess, or cavernous sinus thrombosis, although hematogenous spread also may occur. Headache, drowsiness, fever, meningismus, epilepsy, focal hemisphere, and cranial nerve signs should provoke suspicion, relevant investigation, and referral. Acute and/or chronic sinusitis: These conditions may follow rhinoplasty surgery. The surgery may contribute to ostiomeatal dysfunction and may require functional endoscopic sinus surgery following failure to respond to adequate medical treatment. Dehiscence of incisions: Dehiscence of internal incisions usually goes unnoticed. Unless predicted to cause synechiae, this is usually not a problem, as these incisions will gradually heal. The transcolumellar incision must be attended to immediately, or a scar will form, contributing to a poor result. Persistent edema: Initial edema and periorbital ecchymosis may last 10 days. Severity may be determined by difficult osteotomies, use of guarded instruments, long operating times, excessive nasal packing, postoperative vomiting, or raised blood pressure. Apart from avoidance of the foregoing, performance of the osteotomies just before application of the dressing, intraoperative intravenous dexamethasone, postoperative head elevation, cold compresses to the nose, and blood pressure monitoring can minimize edema. Persistent edema and numbness over the nasal tip region may occur following external rhinoplasty and may last several months. This is not a problem if the patient has been forewarned. Skin necrosis: Excessive undermining, injudicious cautery use, and overzealous skin thinning may lead to skin necrosis. This may cause an impaired blood supply and infection. Similarly, a tight dressing may cause vascular impediment and skin necrosis. Debridement and secondary healing is encouraged if necrosis occurs. Later, local steroid injection, dermabrasion, laser modification, and/or flap reconstruction may be necessary to aid scar aesthetics. Skin necrosis may also result from dorsal augmentation, in which case removal of the augmenting material may be necessary. Sequestra formation: Sequestration of bone or cartilage may occur with subsequent infection, extrusion, and attendant deformity (which may be aesthetic or functional). In such circumstances, the infection is first controlled with antibiotics and/or surgical debridement. Reconstructive measures may be necessary at a further stage. Cardiovascular insufficiency: In the elderly and those with cardiac disease, nasal packing can lead to hypoxia and associated problems. Simultaneous oxygen therapy is advisable under these circumstances. Cerebrospinal fluid rhinorrhea: The prevalence of this complication is not high. A history of previous trauma may provoke its occurrence, as may the presence of congenital osseous defects. Identification of beta-2 transferrin in the draining fluid constitutes a definitive diagnosis. Most leaks heal spontaneously. Persisting leaks need localization and repair by extracranial and/or intracranial techniques. Contact dermatitis: The dressing may contribute to this complication in sensitive individuals. Initial treatment involves removal of the dressing and administration of indicated antihistamines and/or steroids. 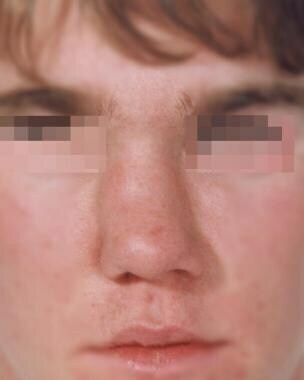 Nasal blockage: Postoperative trauma with the resultant edema and swelling can cause transient nasal blockage. Reassurance is all that is needed initially. Persisting nasal blockage may be related to vasomotor rhinopathy or unmasked allergic rhinitis. Patients who fail to respond to medical measures may require surgical turbinate debulking if causative. Numbness and pain: Transient numbness and pain behind the upper incisors may be attributable to neurapraxia of the nasopalatine nerve. Transient hyposmia is expected following nasal surgery and is related to several factors, including edema, direct trauma to the neuroepithelium, and use of certain pharmacologic agents. This is a rare complication and may be related to past trauma. Disturbed pressure gradients in the sinus cause orbital pain, proptosis, ophthalmoplegia, visual impairment, and an audible bruit. These signs and symptoms suggest the diagnosis, which can be confirmed by angiography. Modern neuroradiological treatment involving transarterial detachable balloon embolization has a high success rate. Reassurance demand: A small number of patients need the surgeon to repeatedly express that the nasal blockage will disappear, the smell and taste sensation will return, the teeth anesthesia will subside, and the tip projection and swelling will decrease in time. Scar hypertrophy: This may detract from a good result following an external rhinoplasty. Skin loss from infection and necrosis is a disaster. Aim initial attempts at reducing the size of the scar with intralesional steroids. Further treatment could include dermabrasion, lasers, and/or surgical scar revision. This deformity is characterized by absence of the supratip dip and may present in degrees. The cause usually lies in undercorrection of the cartilaginous dorsum and the superior septal angle region (hard polly beak), but it may result from excessive accumulation of soft tissue scarring or loss of tip support (soft polly beak). See the image below. The polly beak nasal deformity with loss of the supratip dip and ptosis of tip is shown. In this case, a subcutaneous scar required excision with insertion of a columellar strut. Correction may require reduction of the cartilaginous dorsum and the superior septal-angle cartilage region and/or excision of the soft tissue scarring and fixation of a columellar strut. Oleogranulomas or dorsal cysts occurring in the supratip region may cause a deformity similar to polly beak deformity. In difficult cases, a CT scan may be necessary to confirm the diagnosis. Synechiae formation: Synechiae or adhesions follow the creation of opposing raw surfaces. This occurrence may or may not be symptomatic. Stenting may be attempted if this complication is predictable at surgery. Endoscopic excision and subsequent stenting may be used to treat symptomatic synechiae. Septal perforation: The prevalence of this complication has been described as 3-24.5%. Surgical closure may be attempted with smaller symptomatic septal perforations. Various techniques are described, and various success rates are quoted. If all else fails, a septal button is always available. Nasal valve collapse: Aggressive cephalic trim of the lower lateral cartilages may provoke this complication. Collapse may cause airway distress and is a source of patient discontent. Cartilage spreader grafts may prove useful for internal valve collapse. Alar batten grafts improve external valve collapse. Nasal stenosis: This is a disaster when it occurs, and it may be related to circumscribed incisions with excessive lining removal. Stenosis causes airway obstruction and is a source of persistent discomfort. Reconstructive surgery may provide some relief. Bossae are protuberances that may arise in the region of the nasal tip. Their postoperative incidence is quoted at 2%. While bilateral symmetric occurrences may assume a pleasing appearance, bilateral asymmetric and unilateral bossae demand surgical attention. During operation, ensuring that the remnant lower lateral cartilages are of equal dimensions on both sides is important. 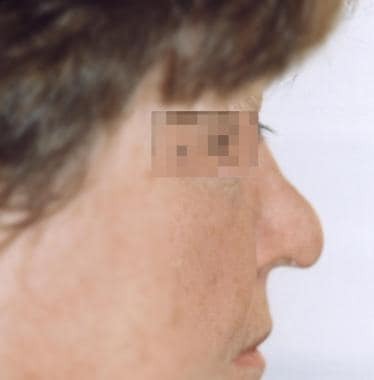 Bossae usually occur in noses with preoperative asymmetry, use of destructive rhinoplasty techniques, thin skin, and excessive postoperative scarring. The triad of thin skin, strong cartilages, and bifidity also indicate the patient who is prone to the development of bossae. Tip graft movement may also contribute to bossa formation. Recurrent meningitis: Recurrent attacks of meningitis may follow an inability to localize a covert fistula. Apart from treatment of the attacks, continue attempts to locate the leak. Oleogranuloma: Unabsorbable fatty material used on nasal packing may provoke an inflammatory reaction (variously termed as oleogranuloma, lipogranuloma, paraffinoma, oil granuloma, sclerosing lipogranulomatosis, and myospherulosis). A CT scan excludes other causes for the deformity. Surgical excision of the tissue is indicated with an appropriate warning of possible recurrence. Dorsal cyst: Nasal mucosa displaced into the subcutaneous tissues may lead to this rare complication. Endonasal removal may be possible. Skin entrapped subsequent to injury may lead to an implantation dermoid, necessitating surgical removal. Undercorrection or overcorrection of a preexisting deformity leads to either persistence of the deformity or to introduction of a new one. A new deformity may introduce a functional deficit. Some of these deformities are illusory, and correction only follows after an accurate diagnosis is made. Ideally, revision rhinoplasty should not be performed until at least 12 months after the initial operation. These deformities may occur singly or in combination and may relate as an x-axis (width), y-axis (height), or z-axis (depth) deformity/deformities in the various segments. Deep nasofrontal angle: Correction may be achieved by augmentation. Various graft and implant materials are available. Shallow nasofrontal angle: The angle may be deepened by removal of the procerus muscle. If the problem is bony, osteotome and/or burr removal are possible corrective measures (after establishing the nasal starting point with a 2-mm osteotome). Upper third widening: This may relate to inadequate medialization of the nasal bones after osteotomies. Widening may also be caused by cephalic greenstick fractures returning the bones to their original position or by excessive nasal packing lateralizing the nasal bones. A persisting deviation of the perpendicular plate of the ethmoid bone prevents medialization of the nasal bone, usually unilaterally. The rocker and open roof deformity are discussed in previous portions of this article. Correction involves ensuring an undeflected nasal septum and recreating appropriate osteotomies that are stabilized medially. Upper third convexity: Satisfactory results may be obtained by reduction. Careful rasping is advised at reoperation. Upper third overreduction: Excessive hump removal may cause saddling, which requires augmentation. Loss of the septal buttress contributing to the deformity may require reconstruction. 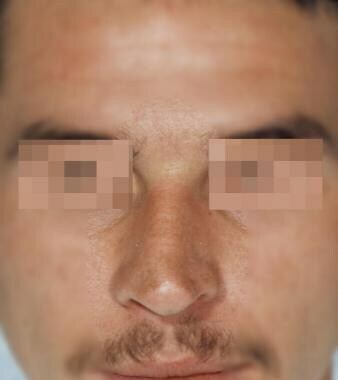 Upper third asymmetry: Unequal nasal bone remnants, asymmetric healing, and deviation of the subjacent septum contribute to this condition. Rectification depends on cause. Middle third widening: This usually follows upper third widening due to the attachment of the upper lateral cartilages to the nasal bones. Correction of the upper third leads to a middle third correction as well. This deformity may also be illusory in the presence of tip ptosis. Middle third convexity: This is one of the causes of the polly beak deformity. Simple shaving of the excess cartilages or soft tissues corrects this condition. Middle third saddling: Augmentation improves the aesthetic result subsequent to rectification of any septal insufficiency. See the image below. Illusory widening of the upper and middle third of the nose due to saddling. Middle third asymmetry: Unequal upper lateral cartilage remnants, unilateral dislocation of an upper lateral cartilage, subjacent septal deviation, and asymmetric healing can contribute to this deformity. Again, correction depends on an accurate diagnosis. Lower third widening or flaring: Destructive techniques resulting in loss of available support from the lateral crura of the lower lateral cartilage may cause widening of the alar base. A columellar strut and alar sill resection may provide a corrective answer. The Foman cinching suture is a useful choice in some circumstances. This involves undermining the floor of the nose through an internal Weir incision, inserting a suture through the incision to one alar crease, turning this suture around to the other alar crease, and finally tying it in the incision. A clear nylon 4-0 suture is appropriate and is tightened as desired. Tip widening or boxy tip: This author generally favors domal suture techniques, although other techniques are also available. Tip narrowing or pinched tip: Destructive techniques may be contributory. Bossae formation and nasal valve collapse may coexist. A carefully stabilized tip graft may suffice in simple cases. Airway complaints may need further intervention. See the image below. Tip asymmetry: Destructive techniques may provoke lower third deformities. Explore causes with appropriate correction. Camouflage grafts may be necessary, and transdomal sutures may aid stabilization. See the image below. The tip of this nose is clearly asymmetric and deviates to the left. Tip projection deformities: Surgically induced tip ptosis may require domal sutures, projection control sutures between the caudal septum and medial crura, columellar strut graft, and/or tip graft. Excessive tension of the depressor septi muscle may need release. Overprojection of the tip may be illusory and may require dorsal augmentation. In some cases, a transfixion incision and reduction of the cartilaginous septum and/or reduction of the nasal spine may need to be considered. Such surgically induced tip ptosis may lead to flaring of the alae, which may need further aesthetic balancing. Wide columella: This is usually a preexisting abnormality that was not corrected during the initial operation. The excess soft tissue between the medial crura is excised and the medial crura are sutured together. Should medial crural flaring be responsible, crural trimming and relevant antiflare sutures are used. Hanging columella or "columella show": This may be caused by deep medial crura, caudal projection of the septal cartilage, and/or excessive removal of the lateral crural segments and subsequent scarring. Treatment is directed to the cause, and shaving of the medial crura/septum may be recommended. Excised lateral crural segments may need replacement with intranasal composite grafts. "Hanging" or "veiled" alae: True alar overhang may be related to underexcision of the lateral crura in relation to the columella. Attempt direct correction of this deformity only when obvious and gross and when an illusory component has been excluded. A columellar strut and nasolabial plumping grafts may provide some aesthetic relief. Alar notching: Excessive removal of the lateral crura and subsequent scarring can lead to this problem. True alar notching may be amenable to caudal or cephalic mobilization of the remnant crura and to insertion of an intranasal composite graft in the created defect. A columellar strut may correct illusory notching due to alar flare. 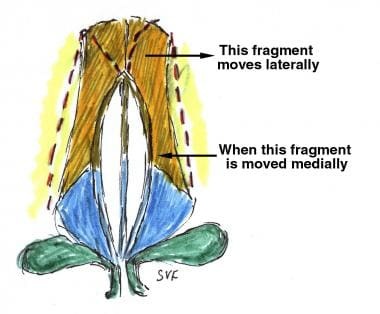 Alar collapse: Excessive removal of the lateral crura dampens support afforded by these structures, causing alar collapse and airway discordance. Reconstructive techniques with alar battens may be necessary in difficult cases. Nostril asymmetry: This may be related to columellar or alar components, thus treatment is directed accordingly. Caudal subluxation of the septum is often contributory and needs attention. Attendance to the nasal spine and performance of alar base surgery is sometimes indicated. Retracted nasolabial angle: Excessive excision of the septal cartilage in the region of the posterior septal angle may lead to this deformity, which may be corrected by insertion of plumping grafts in the region. A columellar strut and upward tip rotation may introduce an illusory enhancement. Protracted nasolabial angle: This may be illusory with excess upward tip rotation. Otherwise, excess soft tissue or nasal spine may need attention. Graft/implant migration: Migration may comprise resorption, displacement, or extrusion; it may be provoked by trauma and infection. Allografts have a higher extrusion and infection rate than autografts. An infected implant must be removed if antibiotics do not help. Revise displaced grafts causing aesthetic inconvenience with appropriate stabilization. The disproportionate nose: This nose does not fit the face and is not a credit to the surgeon's artistic skill. Reconstructive rhinoplasty techniques follow the patient's expression of discontent with original results. Underlying maxillofacial deformity: A superb rhinoplasty result may be ruined by the unmasking of a previously unnoticed or undiagnosed maxillofacial deformity. The maxillae and mandible with labial and dental components must be considered preoperatively and the patient must be forewarned. Attendance by a cosmetic dentist and inclusion of chin surgery may be necessary. A revision rhinoplasty may be required in 5-15% of patients. Any attempt at correction must always be accompanied by a rider promising only improvement and warning that a further "touch-up" operation may be necessary. Persistent psychological complications: Several contradictory studies are available. Some studies claim that most primary rhinoplasty patients are psychiatrically disturbed, with a preponderance of personality disorders. Other studies show prospective patients to be relatively free of psychopathology. Still other studies show postoperative diminution of anxiety, obsessiveness, hostility, and paranoia, accompanied by improved self-concept. Even patients at high risk for poor psychological outcome reportedly benefit from cosmetic surgery. Nevertheless, in some psychologically fragile individuals, preoperative equilibrium may be disrupted. Thoracic and thoracolumbar instability: Interference with the neurovascular supply of the teeth during surgery can cause dental devitalization. A dentist may provide further assistance. Gustatory rhinorrhea: Parasympathetic and sympathetic cross-excitation as a result of misdirected regeneration of nerve fibers subsequent to the trauma of surgery may cause rhinorrhea during eating. The treatment of this condition is difficult, but antihistamines may help some patients. Human adjuvant disease: This is an autoimmune disease caused by hypersensitization to implanted material. Those affected probably are genetically predisposed to such hypersensitivity. If implants are considered, it is wise to probe familial history. In some patients, symptoms may be alleviated by implant removal. If this fails, referral to a rheumatologist is in order. Aesthetic surgery has 4 possible outcomes: (1) a happy patient and a happy surgeon, (2) a happy patient and an unhappy surgeon, (3) an unhappy patient and a happy surgeon, and (4) an unhappy patient and an unhappy surgeon. While the unhappiness of the surgeon usually relates to self-perfection, the unhappiness of the patient has several reasons, some of which may be genuine. The surgeon must be able to carefully select patients preoperatively. This demands a thorough knowledge of the patient's psychosocial status. Even so, selection mistakes may be made, and the temperaments of the surgeon and staff may be tested. No surgical operation is devoid of complications. It behooves surgeons, particularly those performing appearance-altering surgery, to be aware and to be informed of possible complications, avoidance measures, and associated corrective techniques. Patients must be informed of all possible complications, so they can make the decision to undergo surgery after carefully considering all risks involved. The surgeon minimizes complications by carefully selecting patients (through consideration of their medical and psychosocial deficiencies), by having a thorough understanding of deformities and correction techniques, by developing a sense of empathy, and by recognizing his or her own limitations. As understanding of the anatomical, physiological, and pathological factors involved in nasal function and aesthetics improves, rhinoplasty will continue to be refined, and the incidence of complications will continue to decline. Aesthetic trends dictated by society will continue to influence the operation. Implant material hopefully will become more patient-friendly and surgeon-friendly and will contribute significantly to volume-enhancement needs with fewer complications. Technological innovations are leading toward endoscopic rhinoplasty, and computer imaging may soon dictate to the surgeon exactly what procedure is necessary. Berger CA, Freitas Rda S, Malafaia O, Pinto JS, Macedo Filho ED, Mocellin M, et al. Prospective study of the surgical techniques used in primary rhinoplasty on the caucasian nose and comparison of the preoperative and postoperative anthropometric nose measurements. Int Arch Otorhinolaryngol. 2015 Jan. 19 (1):34-41. [Medline]. [Full Text]. Gubisch W, Dacho A. Aesthetic rhinoplasty plus brow, eyelid and conchal surgery: pitfalls - complications - prevention. GMS Curr Top Otorhinolaryngol Head Neck Surg. 2013 Dec 13. 12:Doc07. [Medline]. [Full Text]. Layliev J, Gupta V, Kaoutzanis C, et al. Incidence and Preoperative Risk Factors for Major Complications in Aesthetic Rhinoplasty: Analysis of 4978 Patients. Aesthet Surg J. 2017 Jul 1. 37 (7):757-67. [Medline]. Varadharajan K, Sethukumar P, Anwar M, Patel K. Complications Associated With the Use of Autologous Costal Cartilage in Rhinoplasty: A Systematic Review. Aesthet Surg J. 2015 Aug. 35 (6):644-52. [Medline]. Gall R, Blakley B, Warrington R, et al. Intraoperative anaphylactic shock from bacitracin nasal packing after septorhinoplasty. Anesthesiology. 1999 Nov. 91(5):1545-7. [Medline]. Yoo DB, Peng GL, Azizzadeh B, Nassif PS. Microbiology and antibiotic prophylaxis in rhinoplasty: a review of 363 consecutive cases. JAMA Facial Plast Surg. 2015 Jan-Feb. 17 (1):23-7. [Medline]. Jacobson JA, Kasworm EM. Toxic shock syndrome after nasal surgery. Case reports and analysis of risk factors. Arch Otolaryngol Head Neck Surg. 1986 Mar. 112(3):329-32. [Medline]. Hallock GG, Trier WC. Cerebrospinal fluid rhinorrhea following rhinoplasty. Plast Reconstr Surg. 1983 Jan. 71(1):109-13. [Medline]. Kimmelman CP. The risk to olfaction from nasal surgery. Laryngoscope. 1994 Aug. 104(8 Pt 1):981-8. [Medline]. Riederer A, Wilmes E. [A rare complication of septum surgery: internal carotid artery-cavernous sinus fistula]. Laryngol Rhinol Otol (Stuttg). 1987 Nov. 66(11):583-5. [Medline]. Sarwer DB, Pertschuk MJ, Wadden TA, Whitaker LA. Psychological investigations in cosmetic surgery: a look back and a look ahead. Plast Reconstr Surg. 1998 Apr. 101(4):1136-42. [Medline]. 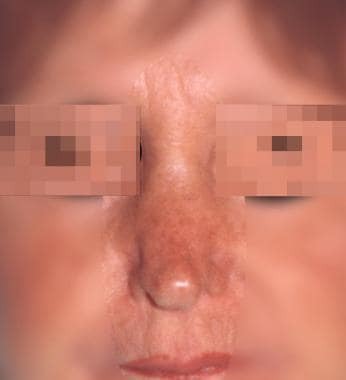 Rettinger G, Steininger H. Lipogranulomas as complications of septorhinoplasty. Arch Otolaryngol Head Neck Surg. 1997 Aug. 123(8):809-14. [Medline]. Guyuron B, Michelow B, Thomas T. Gustatory rhinorrhea--a complication of septoplasty. Plast Reconstr Surg. 1994 Sep. 94(3):454-6. [Medline]. Shiba A, Hatoko M, Okazaki T, Tada H, Kuwahara M, Tanaka A. A case of human adjuvant disease after augmentation rhinoplasty. Aesthetic Plast Surg. 1999 May-Jun. 23(3):175-8. [Medline]. Goldan O, Georgiou I, Haik J, Tessona A, Winkler E. Lacrimal Fistula 10 Years After Closed Cosmetic Rhinoplasty: Case Report. Aesthetic Plast Surg. 2007 Sep.
Eloy JA, Jacobson AS, Elahi E, Shonet MR. Enophthalmos as a Complication of Rhinoplasty. The Laryngoscope. June 2006. 116(6):1035-38. Unlu CE, Saylam G, Korkmaz H, Tatar EC, Ozdek A. Nasal dorsal mucous cyst formation: a rare and preventable complication of rhinoplasty. Kulak Burun Bogaz Ihtis Derg. 2011 Sep-Oct. 21(5):294-7. [Medline]. Bae JS, Kim ES, Jang YJ. Treatment outcomes of pediatric rhinoplasty: the Asan Medical Center experience. Int J Pediatr Otorhinolaryngol. 2013 Oct. 77(10):1701-10. [Medline]. Fernandes SV. Nasal fractures: The Taming of the Shrewd. Laryngoscope. 2004 Mar. 114(3):587-92. [Medline]. Kavyani A, Manafi A. Charlin's Syndrome Following a Routine Septorhinoplasty. World J Plast Surg. 2018 Jan. 7 (1):103-8. [Medline]. [Full Text]. This nose on an athletic male does not look appropriate. The upper third saddling, middle third hard polly beak, and obtuse nasolabial angle further contribute to the appearance of a short nose. Excessive removal of the nasal dorsum and lower lateral cartilages can lead to saddling and alar collapse with a pinched tip contributing to a restricted nasal airway.